For locals in the know, downtown Wyandotte has been a Downriver hot spot for decades, conjuring memories of first dates or “cruising” up and down Biddle Avenue. But more recently, the historical area has been revamped as neighborhood institutions make way for new businesses. One newcomer is Whiskeys on the Water, a bar and restaurant on the corner of Biddle and Oak Street that opened this past St. Patrick’s Day. It took the place of a longstanding business, Why Not Costumes, which shuttered in 2012. The century-old building where delicate and ornately made costumes used to hang has been transformed, not unlike the rest of the downtown strip. Next door is a Dangerously Delicious Pies, born in the 3rd Street Bar in Detroit’s Midtown. 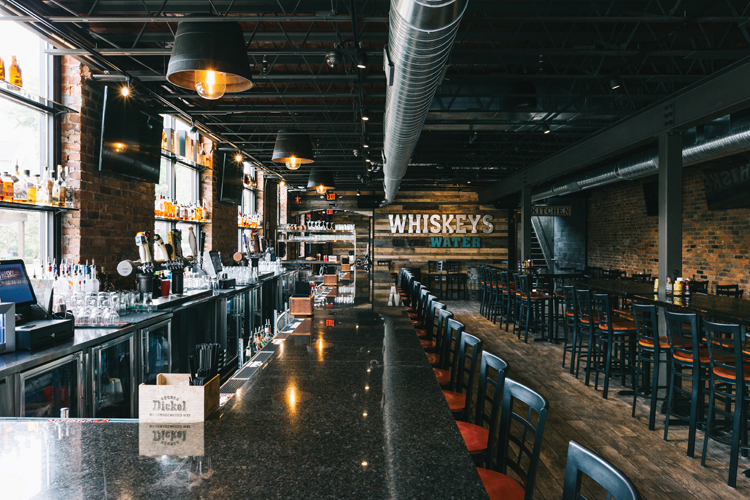 Whiskeys is pulling in regulars and making patrons feel at home. On the Sunday afternoon when I visited, tables were fairly full. The interior has a rustic feel: Mason jar water glasses and exposed brick complement wood floors and plank paneling. Polished dark wood tabletops and a cold stone bar reflect the filament light bulbs and flat-screen TVs lining the walls. The gastropub menu suits the décor. Usual bar fare like sandwiches and burgers are served alongside dishes with an upscale twist like seared ahi tuna topped with a mango pico de gallo and fettuccine capone, made with sweet Italian sausage. While there are typical sides such as crispy battered fries, there’s also the unexpected, such as maple-roasted butternut squash. Even something as simple as the seasonal vegetables (roasted sweet potatoes during our visit), were well done. 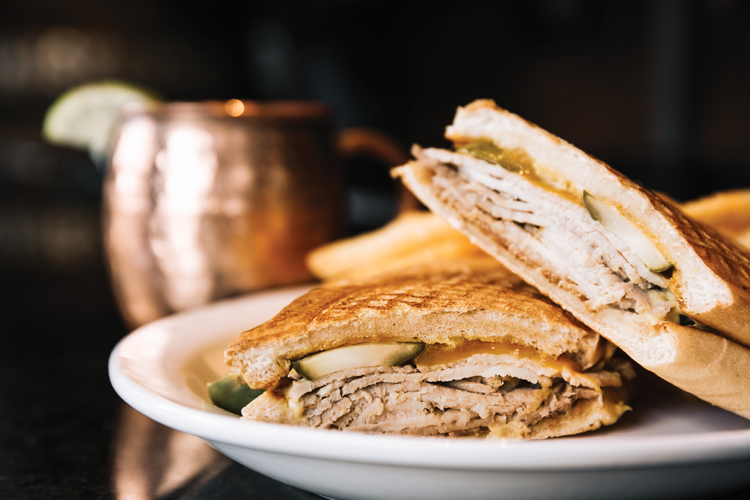 For the main event, we tried the Cuban sandwich — perfectly seasoned, tender pork between pieces of crusty bread. It was served simply, as it should be, with cheddar, Dijon mustard, and pickles. My only complaint would be the portion size of the side of fries, which left me craving for more. The Still Fire Burgerâ€„—â€„topped high with pepper jack cheese, beer-battered jalapeno “coins,” bacon, and Whiskeys’ signature barbecue sauce on a brioche bunâ€„—â€„was a standout. The smoky sauce cut the heat of the jalapenos and brought out the saltiness in the bacon. Menu prices are a little higher than the average bar food, $12 for the burger, but the dish’s quality warrants the charge. The kid’s menu is reasonably priced with $5 meals. The selections include the usual kid-friendly favorites, including chicken fingers and mini burgers. The grilled cheese featuring massive slices of sourdough bread earned a big thumbs-up from our 10-year-old dining companion with a picky palate. 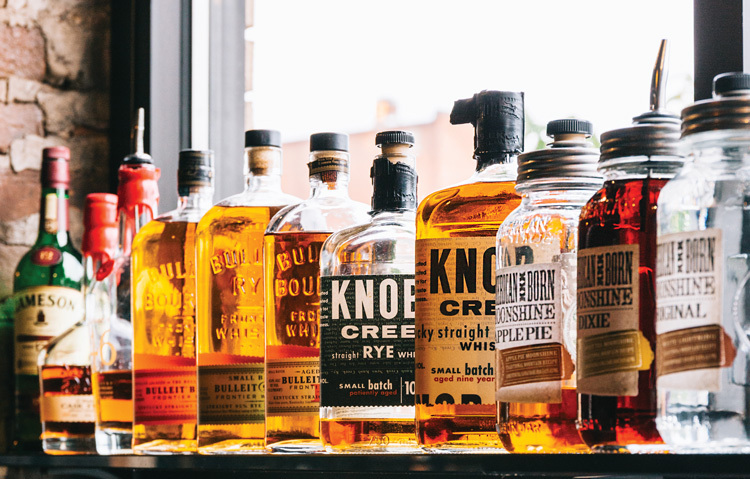 True to its name, the venue boasts an impressive list of whiskeys and bourbons available by the glass or in strong craft cocktails like the Buffalo Nickel, made with Buffalo Trace bourbon, fresh ginger, lemon, and bitters. Michigan-made brews highlight the craft beer list. Not sure what to drink? The knowledgeable staff is happy to make suggestions. While it’s still very much growing, Whiskeys on the River serves as a wonderful reminder that even as downtown Wyandotte changes, patrons can still find family-friendly businesses serving up quality food and drinks. And while locals may mourn the loss of long-standing businesses, spots like Whiskeys can help fill the void and preserve the legacy of downtown. 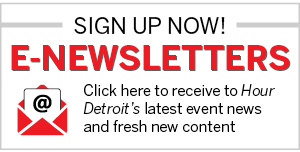 2903 Biddle Ave., Wyandotte; 734-720-9738. L & D Mon.-Sun.